So where did December go. For me it was mostly holidays and more holidays. We didn’t return home until the 18th December so everything was left until late. Even the blog took a back seat. Fishing wise I tried on the H.Avon for chub however it was difficult going with plenty of rain and the river rising and colouring up big time. Sure I landed a good few chub and grayling however nothing much over 5lbs. 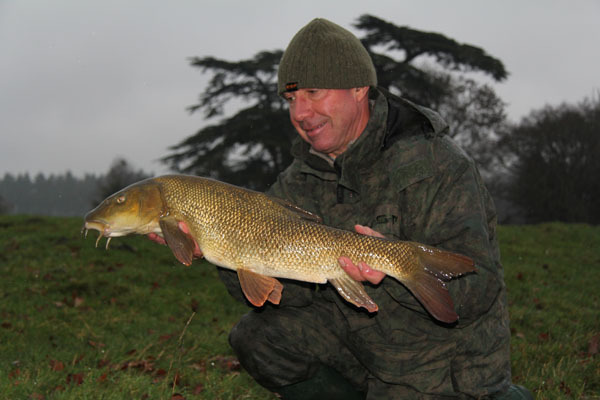 The barbel were certainly feeding well in the mild conditions. Mark a friend had a good few however he has been unlucky not landing any doubles. 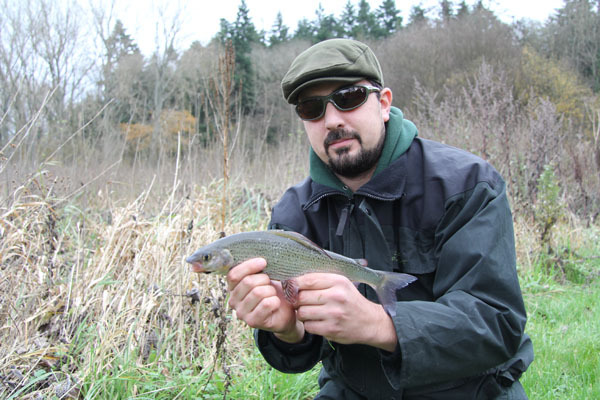 I did guide Nick on a very pleasurable session on the river Itchen where he landed I would have though 50 grayling to just over 1lb. Lots of greedy trout too. The river was just right for spotting feeding fish which he found fascinating. The river is so delightful and tiny in places a joy to fish. When you think it’s £300 for a day’s fishing at the Mayfly time. And £25 for coarse fishing during the winter. 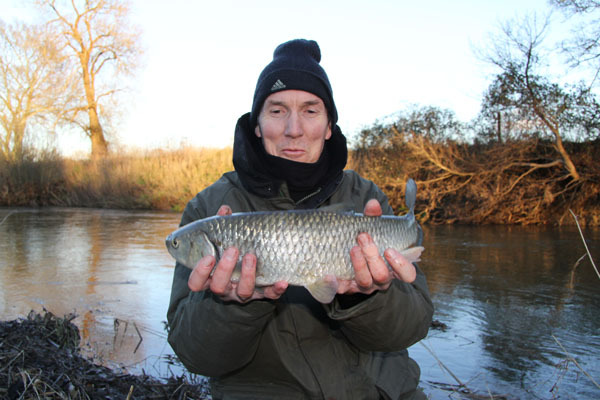 There are also plenty of chub and a few big roach to target. 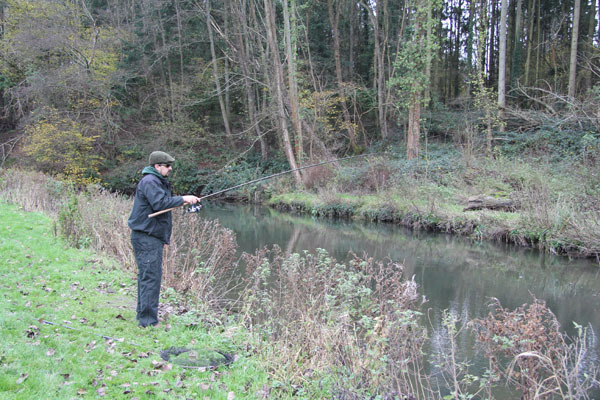 Word is that there are some really large barbel to be had at the bottom of the beat. Few anglers if any fish for them, however they are well over 12lbs. In the free stretch below the fishery they grow even larger at over 14lbs, however it’s all about location, location,location. 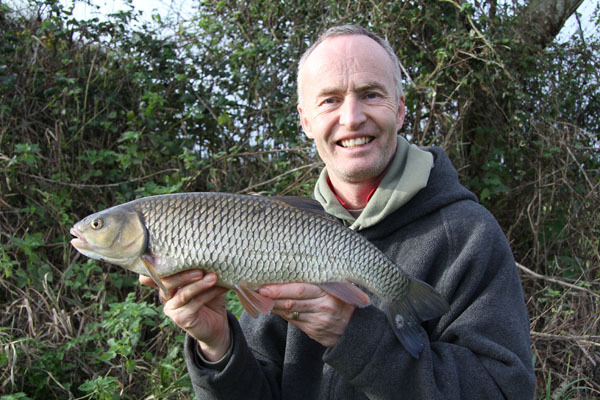 I also had a couple of session with Mark on Throop trying to lure some chub. 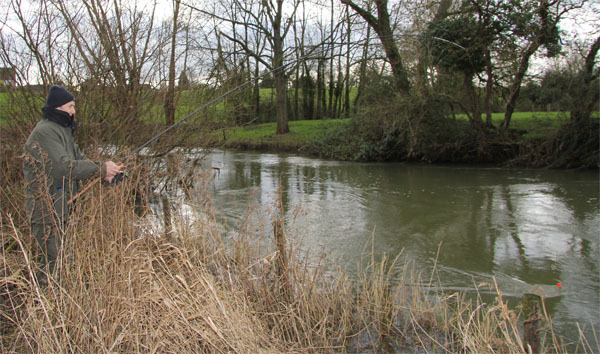 Conditions looked spot on however the fishing was extremely difficult with few chub feeding in the main places. We eventually moved over to the Avon and landed a couple with the best being 5lbs 6oz I believe. It was very much feeder fishing as the wind had been strong. I’m sure should we have float fished then we may have had a few more. Just before Christmas I would hear some devastating news. Colin a friend from Bedford phoned me to say that my life long fishing friend Alan Thomas had passed away suddenly. The news hit me for six for sure. Alan and I go back along way, it was the 70’s when we first met. We used to fish together most weeks and sometimes twice in a week. In the 80’s he moved to Bedford where Colin took over as his fishing partner. The same Colin who had told me of Alan’s death. Colin and I were speechless after he told me. I was in shock for sure. 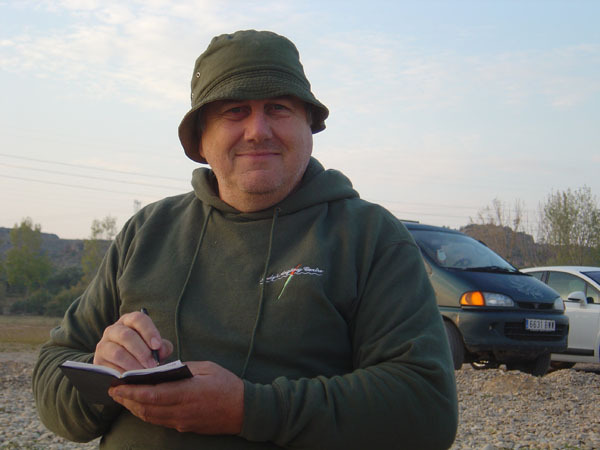 I’m going to write a separate blog about the friend who enriched my life and passion for angling. Words are still tough to write just now however time will heal I hope. So with this terrible news fishing took a back seat again. 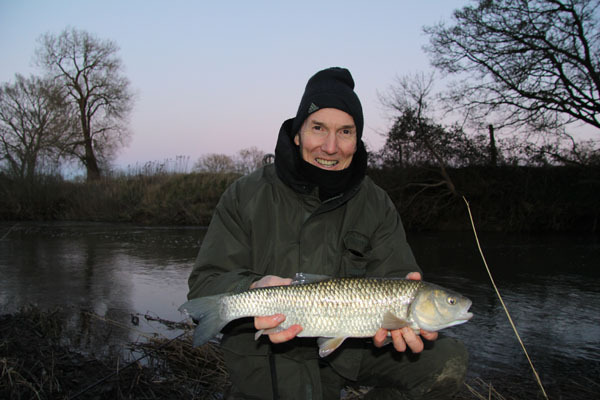 I was shaken, the last time we fished together was on the river Itchen in October. I always set the dates and organise the trip little did I know this would be the very last time I would see Alan again. Colin was more fortunate as he fished with Alan every week. This clearly had an impact on me and my thoughts. The day before Alan’s funeral I need to straighten my head so I headed off the wonderful Avon valley to see whether the crystal clear waters of the Avon would absorb my thoughts. As I approached the Avon through the New Forest I took note that the streams running into the river were that horrible brown colour that spelt disaster for the fishing and particularly the chub. Sure enough the overnight rain meant the river was rising, it was only supposed to be showers however the locals told me it poured all night. Still it was a great day some sun plenty of walking and thinking had the desired effect and my head cleared . The fishing was poor I tried about 4 swims in total however with the coloured water I knew that I was up against it. My last swim does produce some very big chub alas not today. Not even a nibble from a minnow. Some days are like this and I’m sure Alan would have loved to be blanking too. The funeral came, there was his fishing hat sat on the coffin lid the service was as they are. Colin though did a magnificent job of talking about Alan, how he managed it I just don’t know. Well done Colin you summed Alan up really well. Once you became Alan’s friend you were very privileged. Time must move on and so it did. Now John another fishing pal of over 40 years had just been through a difficult operation and had been itching to get fishing as he had recently retired. He had been confined to light duties by the GP for 12 weeks, but I think he slipped the GP £20 so that his misses Caroline would wait on him for the said period. I’m sure I noticed John’s hand writing on the doctors note! Well time does pass quickly. I phoned him to ask about the situation of fishing and he jumped at the chance to get out. So we arranged a short day session on one of the syndicated stretches we have on the Bristol Avon. The river level had been up for two whole weeks making it unfishable. But things changed and bingo the river looked great for pike fishing and perhaps chub. So we met at a very leisurely 9.15am to try for some pike fishing. John had his thermals on which I think might have been a mistake as we walked the half a mile to the top weir. We fished a few slacks which should have produced a fish or two however none were at home. John was getting pretty hot with all the walking. The rig was a dead roach or smelt on the semi barbed trebles with a simple float attached above and a small weight to sink the bait. Braid main line and a 2.25 t/c barbel rod. 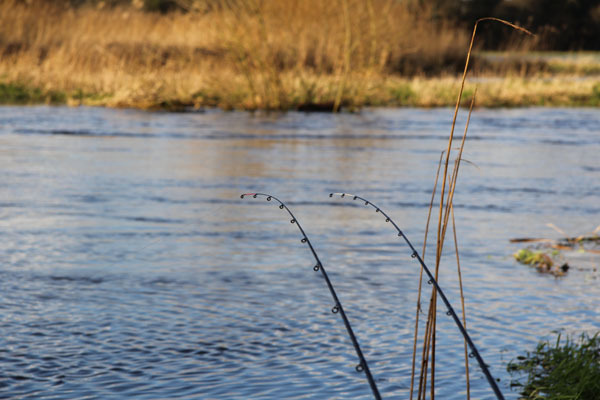 The river is very small and full of features so a 3lb t/c isn’t required as you are not casting very far. The sun shone most of the morning and it was wonderful to be out walking and a great tonic for John I hoped. We then came across a slack that had the juices flowing so to speak. The flow was on the far side of the river with a medium flow mid stream and a wonderful deep slack right at our feet. I had previously said to John to work the bait around under his feet first just in case there is a pike in the slack. He did this twice, then on the third attempt after the bait was taken out of the water a pike swirled where it was clearly intent on devouring the bait. Quick as a flash John dropped the bait back into the swirling water and immediately the pike snapped at it. The float bobbed a few times then accelerated off and John struck into the fish. The rod hooped over and the fight was on. It wasn’t a big fish perhaps 6lbs however the rod had a healthy bend in it. The fish belted around the swim for a good few moments. Soon enough though it was engulfed in the net ready for unhooking. I showed John the method I use for unhooking the fish and it proved to be exceedingly easy. I said to John to drop the bait out again a little further down the bank but still in the big slack. He worked the bait up and down in the slight flow beautifully and bang a larger pike clamped it’s jaws around the dead bait. This time the pike pulled Johns rod around much more, the clutch on the reel gave line and John retrieved it and then the pike would power off again. John was clearly enjoying the fight from this fish. There was a tree just downstream and a couple of times my heart was in my mouth as the pike tried to get into the snag. John did an excellent job in playing the fish which looked much larger than the previous one. Again I demonstrated to John the unhooking procedure. I’m not sure what happened or how it occurred but John managed to get his finger in the gills and guess what blood poured from the wound. Wow there are teeth there he said. On the scales the pike went 11lbs 9oz subtract the weight of the sling (5oz) and it’s 11lbs 4oz. Not bad ! Time had moved on and it was nearly lunch time. We agreed to move on back to the cars for lunch and then challenge the chub to play. The wind had increased in speed and it was cold. The Fox hunt was about we could hear the horn blowing and the sound of horse hoofs pounding on the land and hounds baying. Sure enough returning to the car we found plenty of horsey type vehicle parked up in the field. This is a wonderful sight and sound. Back at the cars with lunch finished we headed downstream for a bit of float fishing. I also had to administer some first aid. As John’s finger was still bleeding it needed a sticking plaster. We headed off down to a weir pool suitable refreshed. The clarity of the river looked just right however it needed to be perhaps 6 inches less in height. I catapulted out the maggots for 10 minutes while to get the chub chasing them. The swim is at the tail of a weir pool. Normally you cannot fail. Well after the third trot down John hooked and landed a beautiful brown trout of about 1lb. We continued to fish however with numerous changes in depth nothing came along. I was very surprised to say the least as normally you can land 6 or more chub from this swim in a couple of hrs. So back to the car we headed and changed our tackle to light quiver rods for a spot of cheese paste fishing. The main line was 6lb straight through and a 1/2oz lead holding bottom. A size 10 wide gap hook finished it off nicely. I was using a Drennan Avon quiver rod and John my trusted Korum river quiver. We walked to my banker swim where for the very first time I blanked. It’s a wonderful slack with a few branches trailing in the river. In the summer you can watch the chub take bread flake and in winter my cheese paste normally works a treat. My cheese paste is normally made from 50% cheese and 50% frozen pastry with a few drops N byteric acid. It does smell a bit and I’m only allowed to mix this in the garage. After 45 mins of blanking we decided the banker swim was more like a blanker swim today. Walking back up to cross the river we found the footpath blocked. So the other alternative was to fish where we had been trotting earlier. So we both cast out our rigs into the river into a crease where there just had to be chub. Sure enough after about two casts my rod top nodded a few times and I gave it line and handed the rod to John who struck and played a feisty chub of about 2lbs. So they were there. Interestingly whilst unhooking the chub coughed up a few maggots/casters. So why hadn’t we not caught it on the float? We continued fishing and it was my rod that produced two more bites. The same process of letting the fish have line results in well hooked chub. One of the chub was about 1lb and the other about 3 lbs. So a great little spell in the late evening sun. It was getting much cooler once the sun settled on the horizon so John and I called it a very successful day. This entry was posted on Saturday, January 16th, 2016 at 12:24 pm	and is filed under Uncategorized. You can follow any responses to this entry through the RSS 2.0 feed. Both comments and pings are currently closed.